The 1860s-1880s brought with them a loss of national feeling among Russian sculptors. Many moved to live and work in Italy or France, with obvious consequences for Russian sculpture. With the advent of the Peredvizhniki, or Wanderer artists, the eminent old Russian masters were forgotten, and the heritage of classical antiquity deemed irrelevant to modern sculpture. In their haste to bury the outdated academic tradition, progressive art critics ceased to distinguish between the academic and the classical, taking up arms against both. The fight against academic canons was futile and absurd, yet its consequences for the art of sculpture were dire. Here, likeness and authenticity ruled, and naturalism became the order of the day to such an extent that sculptors lost all sense of their material, divorcing sculpture from architecture. Such, in a nutshell, was the world of Russian sculpture in the second half of the 19 th century. The sculptor Alexander Mikhailovich Opekushin was born in Svechkino village of the Danilovsky district, Yaroslavl province, on 16 November 1838 (28 November by the old calendar). At that time, the village belonged to Ye.V. Olkhina - a landowner holding a civil title of the seventh class. The poor soil in those parts forcing local inhabitants to seek seasonal work outside the village, the Yaroslavl province boasted many fine craftsmen. The clay workers of Svechkino, Rybnitsy, Davydkovo and Ovsianiki villages were well-known and frequently asked to work in Yaroslavl, Kostroma and even Moscow and St. Petersburg. The Opekushins, Kozlovs, Kuropatovs, Itoshkins and Dylevs had been master clay workers for generations. Well-skilled in this trade, Alexander Opekushin's father Mikhail was also a self-taught sculptor. 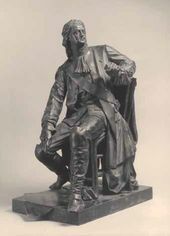 Having studied in St. Petersburg, he became one of the best model makers at "Nicholls & Plincke” bronze works owned by the Englishman Robert Cohoon in the capital. His clay shepherds, shepherdesses and fairytale characters and beasts were always in high demand at village fairs on the Volga, bringing his family a modest, but regular income. Thus, little Alexander's love of clay was taken perfectly seriously by those around him. When the boy reached twelve, with Olkhina's permission Mikhail Opekushin took his son to St. Petersburg to learn his trade. The boy was placed as apprentice in a clay workers' and plasterers' artel. The job was hard, yet Alexander's fellow-workers noted the boy's love of art. Soon he was entrusted not only with unskilled tasks, but also with finer work on simple decorative features. With the help of the artel, Mikhail Opekushin managed to enrol his son in the drawing school of the Society for the Encouragement of Artists, where Alexander studied until 1852. By some accounts, the boy completed the three-year course in two years, moving on to work in the studio of the Danish sculptor David Jensen. A graduate of the Copenhagen Academy of Arts, Jensen was Academician of Sculpture and a pupil of the eminent Bertel Thorvaldsen. Together with Ivan Reimers, in 1845 he founded in St. Petersburg a factory "for the manufacture of works of art and decorative ornaments in terracotta, with studio”, which survived until 1895. The classical sculpture of Thorvaldsen and Canova was much admired in Jensen's little "academy on the river Karpovka”, and the Danish sculptor's own work, stately and imposing, was in the late classical style. Opekushin spent five years in this studio: David Jensen could be said to have been his first professional teacher. Jensen valued his pupil's desire to learn, and entrusted him not only with copying plaster decorations, but also with making decorative sculptures, caryatids and ornamented compositions. In Jensen's studio Alexander Opekushin acquired the basic skills of a sculptor. Soon, he became known as a good clay worker. Leading a frugal existence, he worked hard, taking on extra work and saving every penny in order to buy his freedom from Olkhina. His dream came true in 1859, when Opekushin turned 21: paying 500 roubles, he finally became a free man. David Jensen aided him in this task, subsequently helping him to obtain the right to attend the sculpture class at the St. Petersburg Academy of Arts. Here, Opekushin continued to study the classical tradition, the Academy offering no other approach. In 1862, Opekushin submitted for competition his sculpture "The Angel Announcing the Birth of Christ to the Shepherds”. The elegant, yet simple composition and excellent execution were ample proof that the young man had learned much about classical sculpture: for this work, Opekushin was awarded a small silver medal. The study of Thorvaldsen's approach did not prevent the young sculptor from creating clean, harmonious images. The Academy of Arts acknowledged Opekushin's success: in January 1864, below the list of graduates awarded the title of artist, the following note was made in the journal of the Board of the Academy: "...furthermore, for his studies made for sculptures, the pupil of Academician Jensen Alexander Opekushin . is hereby awarded the title of 'ungraded' artist.” One must not, of course, forget that obtaining success at the Academy of Arts was never easy for commoners, and a former serf without money or connections would find it almost impossible. All the titles subsequently gained by Opekushin cost him much hard work and many humiliations. A mere attender could never be considered a full member of the Academy. In the Academy archives, Opekushin is mentioned only as a pupil of David Jensen's, whose work was exhibited in the institution. If ordinary Academy students who passed their examinations successfully received the title of "class” (graded) artist upon graduation, Alexander Opekushin had to work for this title for six long years. Such was Opekushin's status, that the young sculptor was grateful for any opportunity to help a well-known sculptor, even where this meant working exclusively on another master's projects. With 17 years of study and practice behind him, Alexander Opekushin left Jensen's studio to work with Academician Mikhail Mikeshin, whose acquaintance he had made in 1862. Only after ten years as Mikeshin's helper was the sculptor finally able to start working independently. A pupil of Bogdan Willewalde, Mikeshin was known as a talented graphic artist. Famous for his illustrations of works by Gogol, Shevchenko and other writers, he was also a born sculptor. Ignorant of the practice of sculpture, Mikeshin was, nonetheless, responsible for the design of a large number of statues. At that time, for competitions for the design of statues it was possible to submit not only sculpture studies, but also sketches and drawings. Striking and original, Mikeshin's designs always boasted interesting composition and rich decoration. The first such competition the artist entered was in 1859, the task then being to design a monument to "The Millennium of Russia”. Mikeshin's plans won first prize. To help him in his work, Mikeshin called upon Academician Robert (Roman) Zaleman, Ivan Schroeder, Nikolai Laveretsky and the young sculptors Mikhail Chizhov and Alexander Opekushin. The clients, however, liked the design, and, in 1862, the Monument to the Millennium of Russia was unveiled in Novgorod. From the mid-1860s, Opekushin often worked on sculpture portraits. In 1869, for his bust of Mikeshin, low relief of the merchant Posokhov and bust of the actor Komissarov-Kostromskoi, he finally received the title of "class” artist of the second grade. A year later, he was awarded the title of class artist of the first grade for his bust of Mrs. Weimarn and medallion of the Countess Shuvalova. Of all the sculptors who had worked on the Russian Millennium monument, Mikhail Mikeshin singled out Opekushin to help him create a statue of the military governor of Nikolaev - Admiral Alexei Greig. The project was to be Mikeshin's, and the figure of the admiral Opekushin's. The unveiling of the statue in May 1873 became an important event in the history of the town of Nikolaev. Putting the ideas of others into practice allowed Opekushin to make a living and to acquire experience, yet he learned to follow his own creative path. His first independent work was a statue of Peter the Great: the young sculptor had, of course, already studied this historical figure. 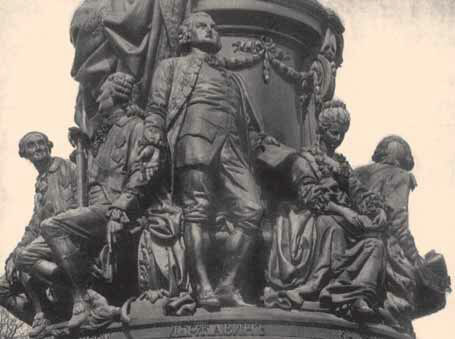 Opekushin's image borrows much from Nikolai Ghe's "Peter the Great Interrogating Tsarevich Alexei in Peterhof. Shown at the first exhibition of Wanderer Artists (Peredvizhniki) in 1871, this painting depicts the monarch not as a hero of ancient times, but as a human, a man with feelings and emotions like any other. Opekushin followed suit. His Peter stands in a natural, relaxed pose. Leaning on the back of a chair, he points at a map of the city-to-be which lies at his feet. The figure of Peter appears to uncoil in space like a spring, conveying an impression of energy and vigour. The statue proved an important success: in 1872, for this work and the bust of the late crown prince Nikolai Alexandrovich, made for the St. Petersburg Church of St. Nicholas the Miracle-Worker, Alexander Opekushin was made an Academician of Sculpture. That same year, in his new capacity the young sculptor helped another imposing idea of Mikhail Mikeshin's to become reality, creating nine statues for a monument to Catherine the Great in St. Petersburg. These represented the Empress's closest followers and supporters: Alexei Orlov, Grigori Potemkin, Alexander Bezborodko, Petr Rumiantsev, naval commander Vasily Chichagov, Ivan Betsky, Ekaterina Dashkova and Gavriil Derzhavin. The central statue was made by Mikhail Chizhov. This monument finally brought well-deserved fame to Opekushin and Chizhov, and if the main praise was, as always, received by Mikeshin, this time his helpers also won ample acknowledgement. Alexander Opekushin's nine statues were heralded as an important success. Thenceforth, the sculptor worked independently. Soon, an excellent opportunity to put his own ideas into practice presented itself. In 1860, the fiftieth anniversary of the Lycee in Tsarskoe Selo, a plan had been mooted to erect a statue to one of the Lycee's most eminent graduates - the poet Pushkin - in Tsarskoe Selo. The government refusing to finance the operation, an independent collection had been organised. This desire to erect a statue of Pushkin using funds raised by the people was a sign of the Russian nation's growing self-awareness. The importance of monumental sculpture was at that time largely decided by popular opinion. The positive ideal represented by a statue was highly valued, which served to influence the work of many sculptors. Opekushin felt himself eminently capable of expressing his people's respect for this historical hero, which is, undoubtedly, why his design was finally chosen above all others. A Committee consisting of Tsarskoe Selo Lycee graduates was established to manage the creation of the statue. 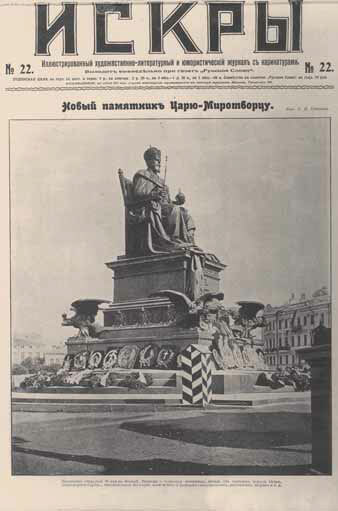 At the suggestion of committee member Admiral F.F.Matiushkin, it was decided to erect the statue in Moscow. After much discussion, a particular spot was also selected: the end of Tverskoi Boulevard, opposite the Strastnoi Convent. In 1860, a competition for the best design was announced. The papers gave a detailed analysis of each design. The press also gave a good idea of public opinion concerning the statue, and the main shortcomings of plans submitted. Most applicants failed to see the monument as a whole, paying excessive importance to fashionable "muses and allegories”. Meanwhile, public debate had served to clarify certain requirements. The statue had to be focused on Pushkin's identity; it had to be a good likeness whilst coming across as an "ideal image”; the dress needed to be authentic and, of course, the whole had to harmonise with its surroundings. Later in the 1860s, the competition ground to a halt: the money necessary to erect the statue had simply not been raised. By 1873, however, 55, 000 rubles had been collected, and an open competition for the best design was once more announced. A number of well-known sculptors took part, such as the Academician Nikolai Pimenov, who had known the poet personally. 15 projects were submitted in all. Opekushin made two designs for the competition - expertly executed and in good taste, they were, nonetheless, somewhat pretentious and dramatic. Although the judges deemed them to be the best, Opekushin did not win the competition. No winner was selected that year, and the press dwelt long on the unsuccessful event. The following year, a second competition was held, and 19 entries submitted. This time, Opekushin entered four designs, which received a prize from the jury, yet again, no winner was chosen. In 1875, for the third competition, Alexander Opekushin submitted six entries. One of these was chosen by the judges: finally, a design for the statue was selected. Thanks to the competent and demanding panel, which had shown such good taste, a winner had been chosen who could truly carry out the wish of the people. The committee had acted on the demands of the Russian public, and Opekushin was, once more, to execute the will of another in creating his statue: this time, however, the "other” was not a fellow-sculptor, but the Russian people itself. On 18 June 1880, the statue was unveiled. Journalists covering the event noted the relaxed, democratic atmosphere of the festivities: as the statue was erected by private initiative and with private funds, the government barely made an appearance. This was no formal, official gathering, but a day of public celebration, a fitting tribute to Russia's great poet. The statue was placed on a foursided grey granite pedestal decorated with smaller slabs of red granite. Steps led up to the pedestal from all four sides, and the monument was surrounded by twelve short posts decorated with wreaths and linked by a bronze garland of laurel leaves. The figure itself possessed an air of classical austere simplicity. The poet's pose was natural and relaxed, yet filled with dignity. Opekushin had succeeded in combining realism with the high classical tradition and monumental sculpture. Interestingly enough, the Academy of Arts had, from the very outset, pointedly dissociated itself from the entire process. In his autobiography, Opekushin recalled the hostile atmosphere which greeted him at the Academy following his success in the competition. Having, at the age of 32, received the title of Academician, Opekushin now worked in a studio belonging to the Academy. 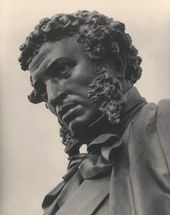 The sculptor made good use of his workspace: when the first Pushkin competition was announced, he had all but finished a statue of Nestor, author of the ancient chronicles. Upon hearing the news of his victory in the final competition, the Academy management gave the sculptor three days to vacate his studio. The clay statue of Nestor, practically complete, was broken, and Opekushin left, as he had been instructed. In a surviving letter to the Academy the sculptor requested the use of a workshop attached to the foundry which had been used by Schroeder. The Academy replied that Opekushin was not a staff member, that the Pushkin competition was nothing to do with the Academy and that the creation of the statue was not a government commission, but a private enterprise. The newspaper "Golos” (Voice) published the following sarcastic comment: "What exactly do they teach at the Academy, if some peasant Opekushin can come along and outdo all the academicians in the Pushkin competition!” Needless to say, such comments from the press did nothing to ease the tension between the sculptor and the Academy. Nevertheless, the turn of the century was a busy, fruitful period for Opekushin: between 1880 and 1920, he produced a further 16 monumental sculptures. His cooperation with Mikeshin continued, primarily in the area of decorative and applied art. For the Moscow art and industry exhibition of 1882, Mikeshin and Opekushin created the decorative compositions "Russia”, "The Volga” and "Oil”. Designed by Mikeshin, the ideas were put into practice by Opekushin - just as before. All three compositions were made in silver at the Ovchinnikov jewellery factory in Moscow. The Pushkin theme was not abandoned by Opekushin, either. Using his designs submitted for the various competitions, the sculptor created several further statues of the poet: in Petersburg (1884), Kishinev (1885), the Viazemsky-Sheremetev estate (1913) and village of Ostafievo in the Podolsk district of Moscow province. Opekushin's statues of the founding father of embryology Karl Ernst von Baer (1886) in Tartu and the poet Mikhail Lermontov (1889) in Piatigorsk were hailed as successes of monumental sculpture, whilst his monument to Count Muraviev-Amursky, Governor-General of Eastern Siberia (1891) erected in Khabarovsk spoke of the sculptor's obvious professional development. Around that time, Opekushin also made a number of statues of Russian Tsars: for obvious reasons, most of these did not survive. 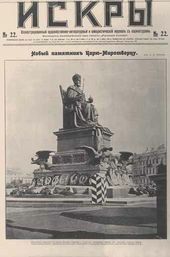 Between 1880 and 1920, for the great hall of Moscow City Duma Opekushin created statues of Alexander II, Alexander III and Catherine the Great. On several of his statues, the sculptor worked for decades. 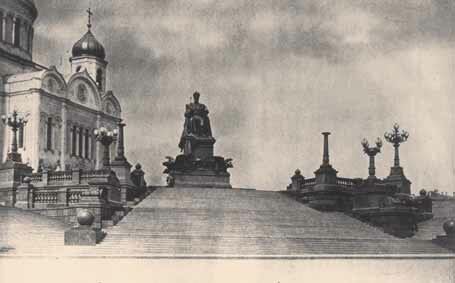 In 1898 and 1912, enormous statues of Alexander II and Alexander III were erected in Moscow, designed by Opekushin. The first stood in the Kremlin, whilst the second overlooked the river Moskva: both were destroyed in the revolution of 1917. At the time of its creation, however, the statue of Alexander II was found particularly impressive by the government: similar statues were subsequently erected in Astrakhan, Kishinev, Pskov and Semenovka village of Novozybsky district, Chernigov province. Opekushin had, it seems, created a canonical likeness of the late Tsar. The Novitsky metal works purchased the exclusive right to cast Opekushin's statue - "the best statue of Alexander II in Russia”. Between December 1910 and May 1911, over 1,000 full-length figures and busts were made using this model. To honour the 50th anniversary of the abolition of serfdom, these were erected in numerous towns and villages. In 1912, the art world prepared to celebrate another halfcentenary: Opekushin's 50 years in sculpture. Always modest and ascetic, however, the sculptor declined to hold any festivities. He had always been a simple worker, a fine craftsman who followed the true classical tradition at a time which was a difficult one for sculpture, and when classicism was largely distorted or forgotten. After the October revolution, the new government, taking into account Opekushin's peasant background and achievements in art, allowed him to keep his apartment in St. Petersburg (then Petrograd), as well as the lifelong pension and regular food packages provided by the Academy of Arts. Among the elderly sculptor's active supporters was the writer Maxim Gorky. Towards the end of his life, Opekushin began to find the hustle and bustle of the city overly tiring. Having worked hard in St. Petersburg, the craftsman finally returned home: to the Yaroslavl province. The man who had created statues of emperors ended his days in a simple peasant's hut. Those who knew the sculptor Opekushin at that time recalled his long grey hair swept back from his face, his tall forehead, beard reaching down to his chest and modest, worn jacket. In March 1923, Alexander Opekushin died. His last wish was to be buried in a simple pine coffin on the bank of the river Volga.